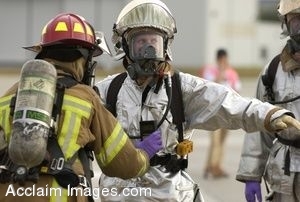 Description: Clip art photo of a firefighter with Jacksonville Fire and Rescue Department checking U.S. Air Force Staff Sgt. Stephen Ingrando, a firefighter with 125th Fighter Wing, Florida Air National Guard, for exposure to chemical, and radiological agents during the tri-annual mass casualty exercise at the Jacksonville International Airport, Fla., Oct. 18, 2006. (U.S. Air Force photo by Staff Sgt. Shelley Gill). Stock photography by Department of Defense Public Domain.